Texas Tech has reportedly decided to part ways with Kliff Kingsbury, who has been there head coach for the past five seasons. I personally believe that this is a mistake on their part, but their loss could end up being the Dallas Cowboys gain. It's no secret that Dallas Cowboys current Offensive Coordinator Scott Linehan has fallen out of favor with not only the fan base, but with the organization as well. It was reported that the Cowboys seriously contemplated firing Linehan during the bye week a few weeks ago, meaning his future with the team beyond this season is probably nonexistent. Woo hoo! I'm just one of many fans around Cowboys Nation who would love for this to happen. Linehan's playcalling has not only been pretty predictable, but held the offense back from reaching their true potential. He just doesn't seem to know how to utilize his playmakers to the best of their abilities and it's time for a change. Kingsbury will finish his tenure as head coach of the Red Raiders with a below .500 record, but it won't stop him from finding a new coaching gig. He has already developed a reputation as one of the young up-and-coming offensive minded coaches and he won't be out of a job for long. In fact, I believe he will be in high demand, which is why I think the Dallas Cowboys should act now, not later. Dallas needs a new OC with Linehan on his way out. They need someone who can not only get the best out of their stockpile of playmakers, but someone who can also help Quarterback Dak Prescott take his game to the next level. To me, that fits Kliff Kingsbury to a "T". You may not be aware of it, but Kingsbury has a proven track record at developing quarterbacks. He has three QBs currently playing in the NFL: Baker Mayfield, Patrick Mahomes, and Davis Webb. He started Mayfield as a walk-on, but he lost his starting job in his second season to Mahomes, which resulted in him transferring to Oklahoma. Webb had to transfer as well in order to get any playing time, and took his talents to California. I can't really think of any other collegiate coaches that have three QBs on a roster in the NFL. That's a pretty impressive thing to have on your resume. But, he's more than just a QB whisperer… he's really good at calling plays to his players' strengths and I believe he's in the same mold of Sean McVay. Kingsbury is a quarterback/offensive mastermind. He is excellent at identifying a defenses weakness and exploiting it. He uses a lot of motion and misdirection to accomplish that, a lot like McVay does with the Rams. It's that kind of innovative thinking the Cowboys offense could use more of. I know Dak Prescott isn't the same kind of QB like Mayfield or Mahomes, but that's okay. Kingsbury's playcalling was completely different with those two as his starters and it would be the same with Prescott. I believe he would maximize his dual-threat ability, which would significantly upgrade the play action offense. To me, this is a no-brainer and I would do everything in my power to bring Kliff Kingsbury aboard as soon as possible if I was the Dallas Cowboys in order to get a leg up on the competition. He's not going to replace Linehan this season, so it would probably have to be as an offensive consultant for the remainder of the year. This could be a win-win, because it would provide an opportunity for Jason Garrett and the front office to get a feel for Kingsbury and pick his brain a little bit about how he would address the offenses shortcomings when/if given the chance. I'd personally treat this as an evaluation period to find out if he's the right replacement candidate or not. I don't know about you, but I would love for the Dallas Cowboys to make this move. Now we just have to wait and see what's going to happen moving forward. 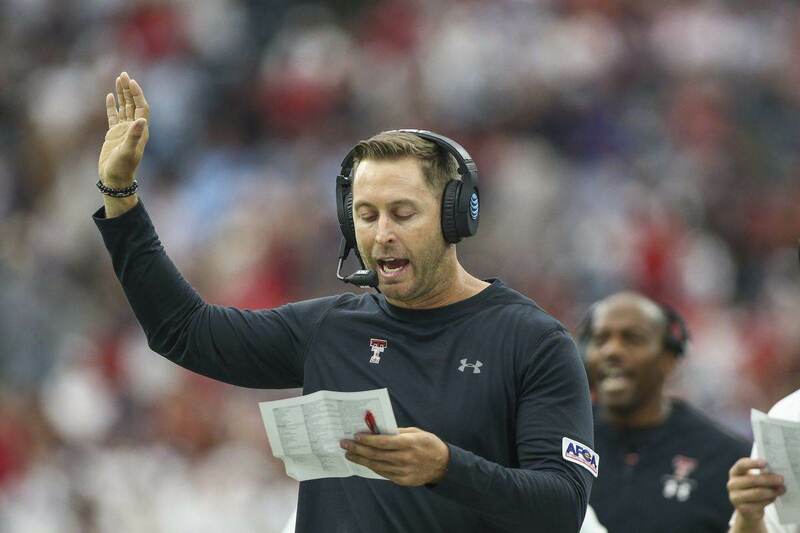 Do you think the Cowboys should try to bring Kliff Kingsbury aboard?